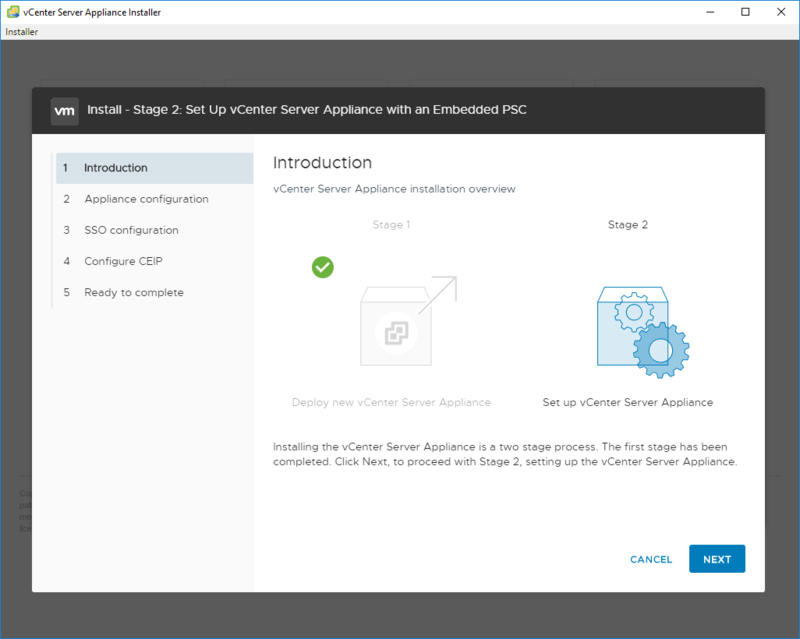 The new VMware vSphere vCenter Server 6.7 dropped yesterday as GA and installation files are readily available for download now. We have already talked a bit about vSAN 6.7. 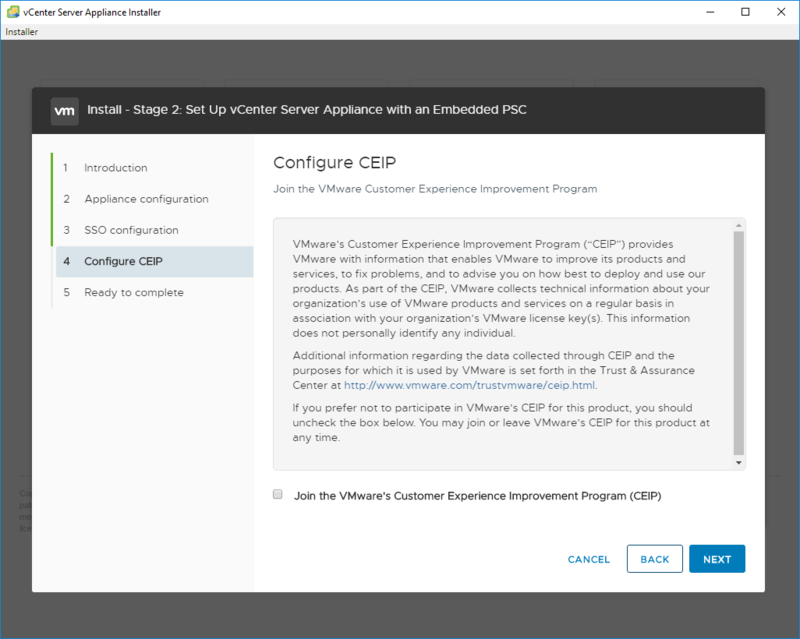 This is certainly an exciting release for VMware and customers! 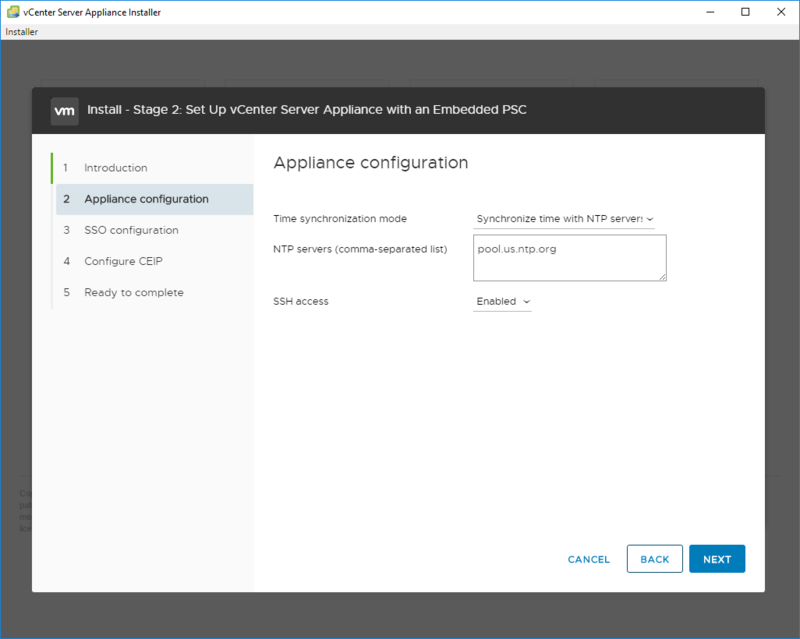 The all new vCenter Server appliance or VCSA is showing itself as being a mature, performant, stable, and powerful platform for running vCenter Server in production. 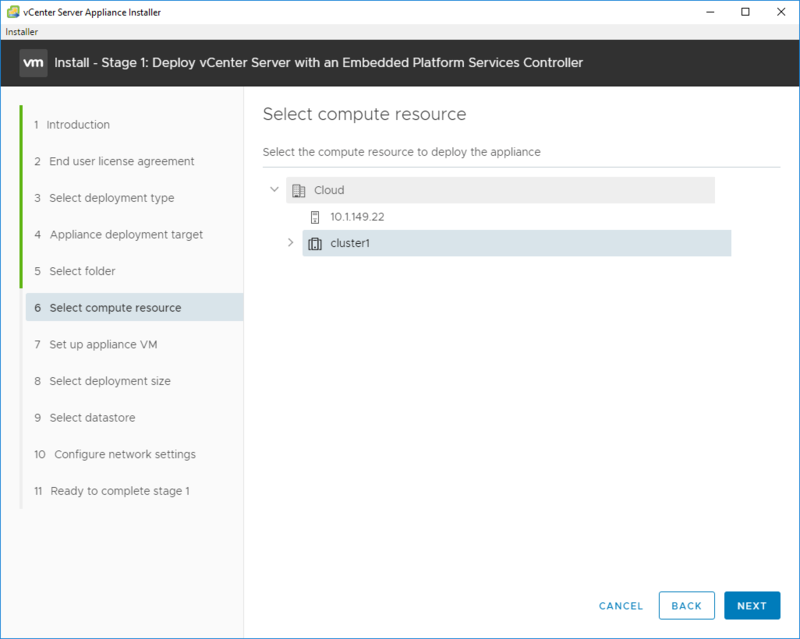 In fact this is the VERY last release of the Windows Server based vCenter Server platform. 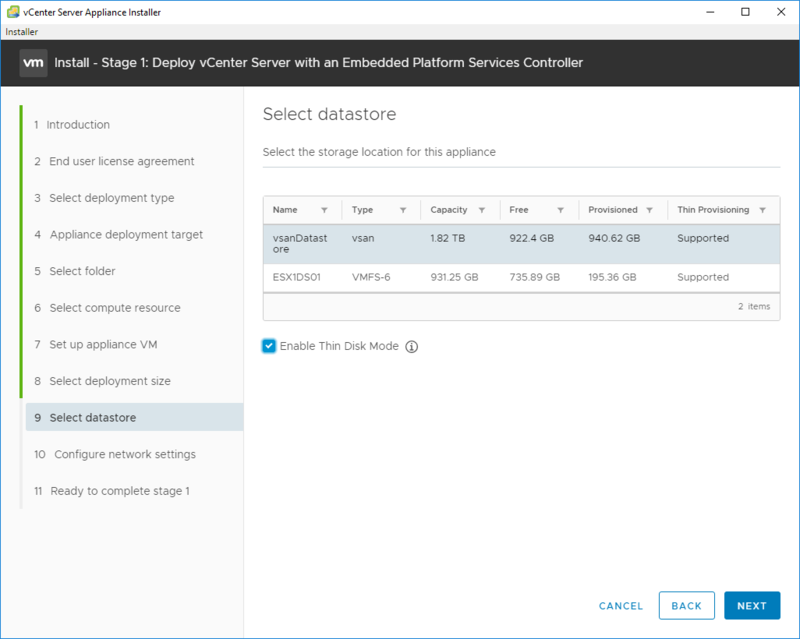 This release of the all new VCSA 6.7 is packed full of really great features and functionality that will make the administrator’s life much easier. Let’s take a look at VMware VCSA 6.7 New Features Installation and Configuration as well as look at the new features that are contained in this exciting release. As mentioned with this release it is chocked full of goodies. Below is a listing of some of the most prominent features that administrators will want to take note of. The new HTML5 clarity UI is getting VERY close to completion with vCenter Server 6.7. The VAMI interface is now sporting the Clarity HTML5 UI interface as well as upgrades in monitoring and a new disks view to view the specific partions, disk space, etc. CLI upgrades in 6.7 include the return of the cmsso-util. 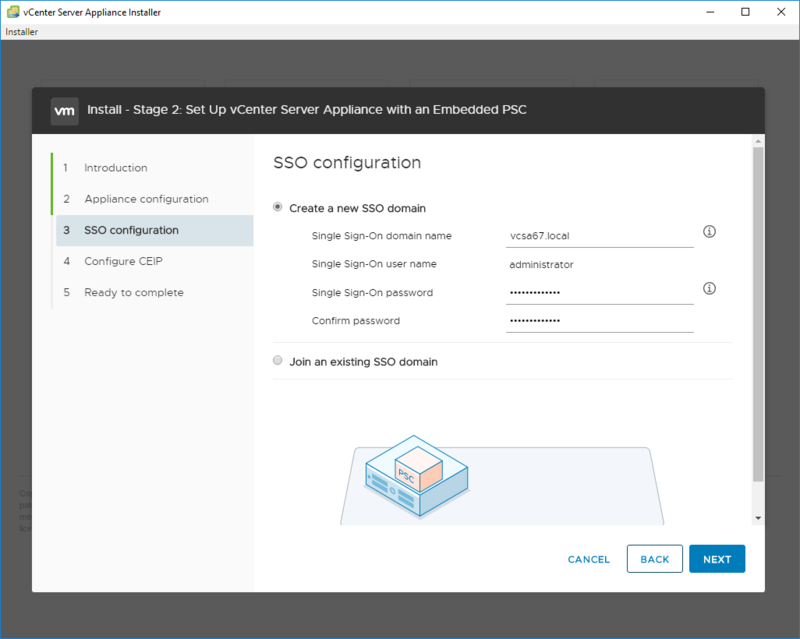 This allows for repointing an external vCenter Server appliance across SSO sites within a vSphere SSO domain as well as across vSphere SSO domains. Additionally, the vCenter Server Appliance ISO comes with JSON template examples. These JSON templates are a way to ensure consistency across installs, upgrades, and migrations. 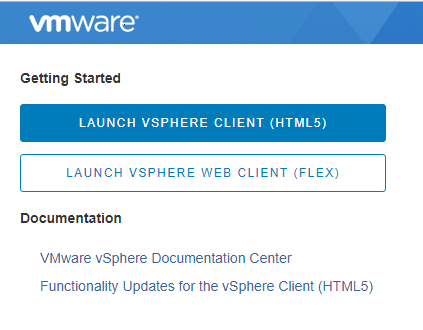 Additionally, the new VAMI interface with the new vCenter Server 6.7 is running on the HTML5 Clarity interface as well. 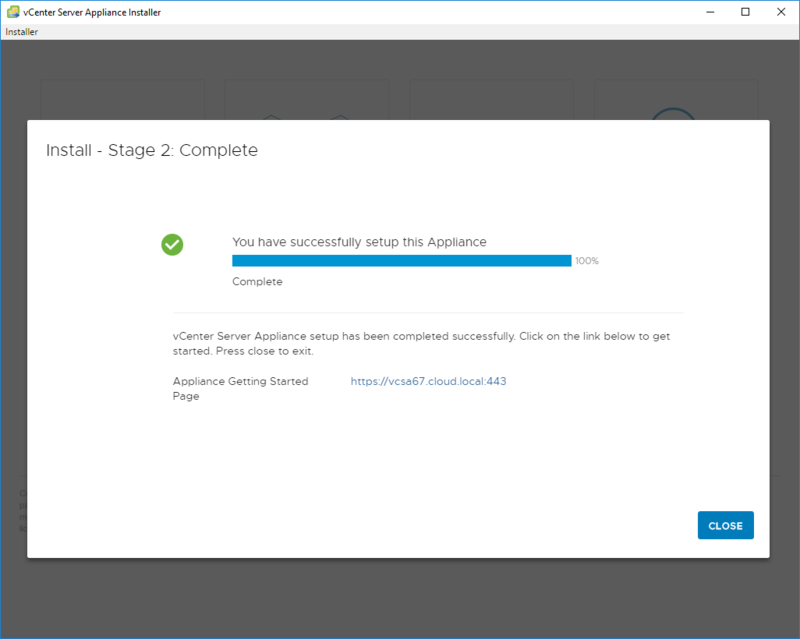 Major improvements all the way around with the new interface in vCenter Server 6.7. 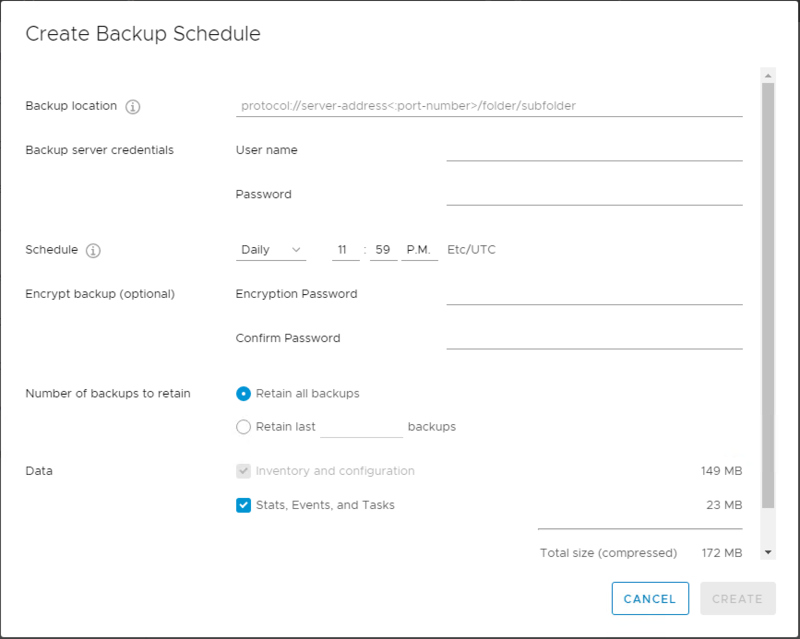 Let’s face it, we all loved the fact there was a file based backup mechanism in vCenter Server 6.5, however, we hated the fact there was not a built-in scheduler to actually schedule the backups. 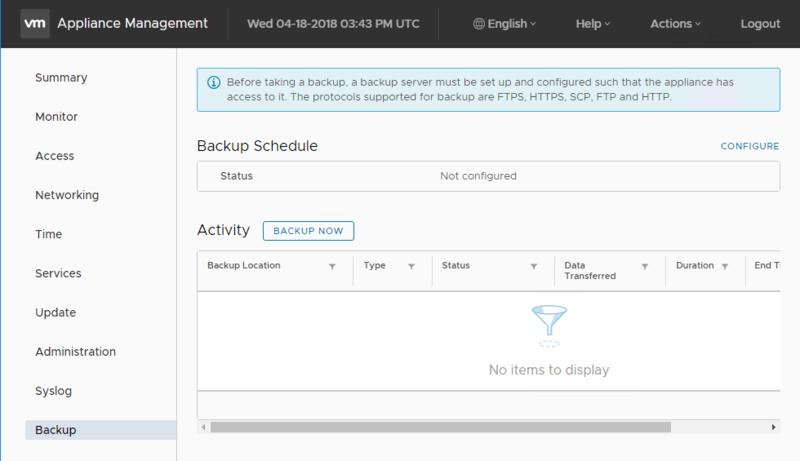 Well, the wait is over now with vCenter Server 6.7, you can now schedule your backups for vCenter Server. 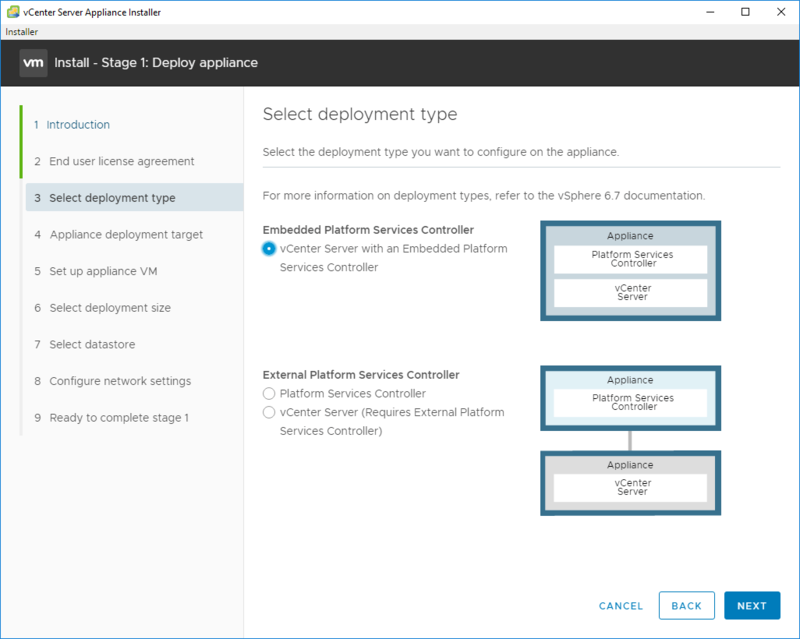 High availability no longer requires a load balancer and fully supports native vCenter Server High Availability. SSO Site boundaries have been removed which provides flexibility of placement. 15 deployments allowed in a vSphere Single Sign-On Domain. New utilities at the command line level such as the cmsso-util command line utility allow manipulation of the vCenter SSO domain pointing across and within SSO domains. Additionally, the vCenter Server Appliance ISO comes with JSON template examples. These JSON templates are a way to ensure consistency across installs, upgrades, and migrations. 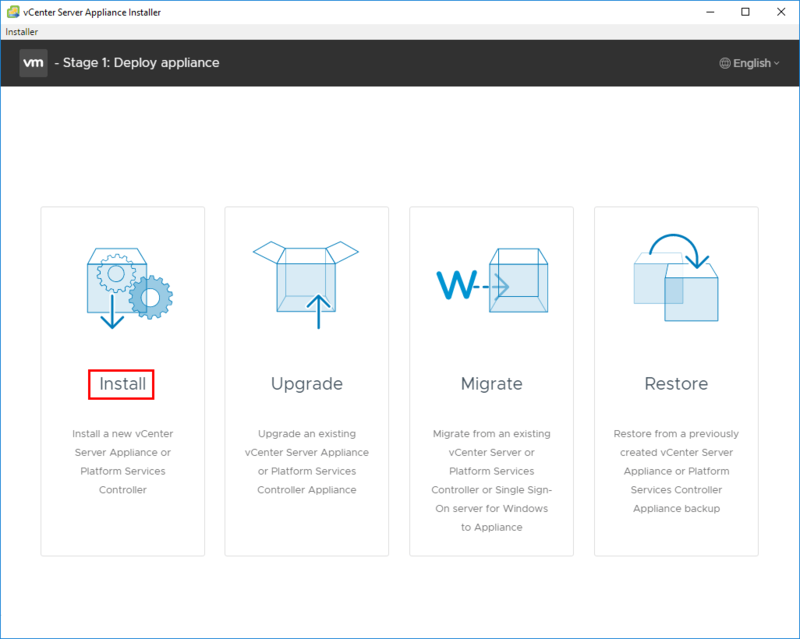 Here since we are deploying a brand new appliance, we choose Install. The installer gives an overview of the installation process with the 2 stages involved. 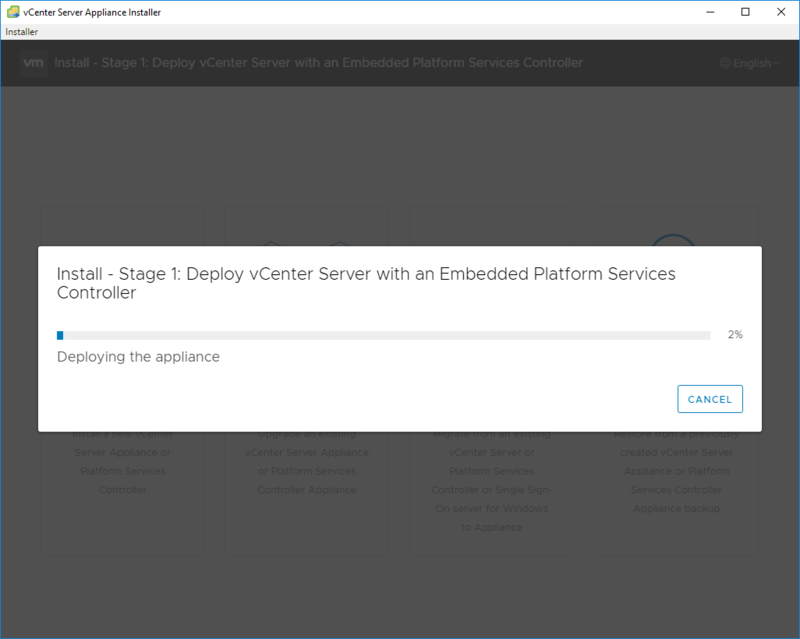 Next, we need to give the installer a target for deploying the appliance – either vCenter Server or an ESXi host. I am deploying the new appliance into an existing vCenter 6.5 U2 server. 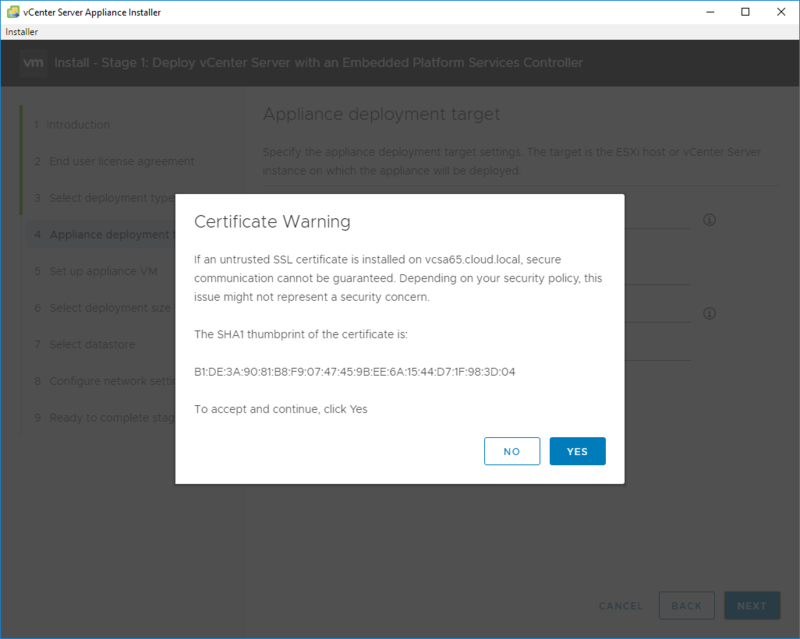 Accept the certificate warning presented from the vCenter Server. Choose the vCenter folder you want to deploy into. Select the computer resource – either a host or cluster. 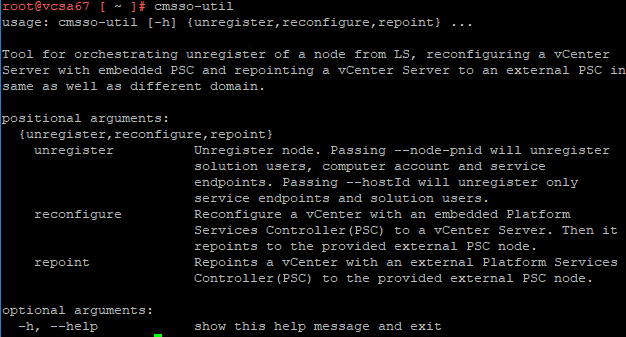 Name the vCenter appliance (what you want it to be called in the vSphere inventory) and also set the root password. Select the deployment size. The installer gives a great overview of the size comparisons. Select the target storage for the appliance deployment. Configure the appliance networking. 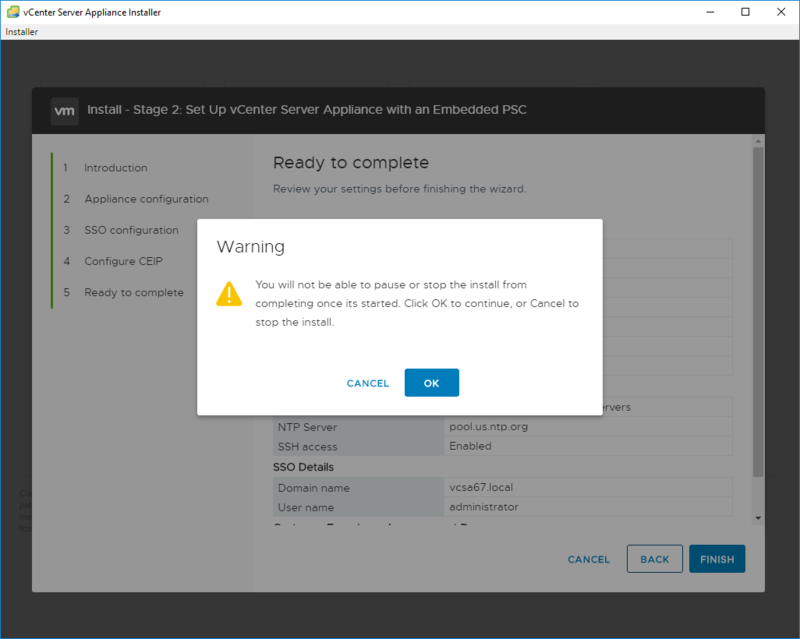 As has been the case with previous releases, make sure you have DNS configured correctly along with an A record for the new VCSA 6.7 appliance. A summary of the configuration is displayed and you are ready to click Finish to begin Stage 1 configuration. Stage 1 configuration completes successfully. Hit Continue to move on to Stage 2 Setup. On the first screen of the Stage 2 configuration we setup NTP configuration as well as choose SSH access options. Extremely important, configuring your SSO domain. Here we either setup something new or join an existing SSO domain. Stage 2 configuration is now ready to complete. 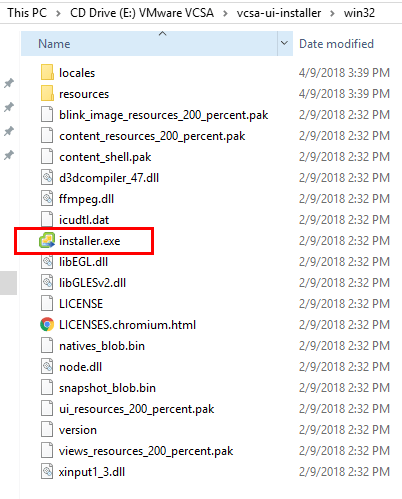 A warning is presented about not being able to pause or stop the installation once it is started. 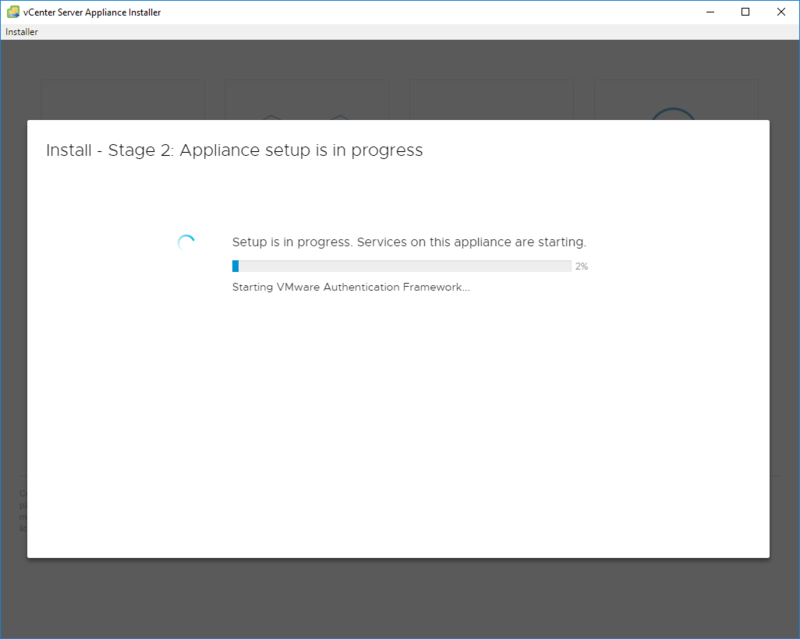 Stage 2 setup begins configuring the appliance with the selected options. Stage 2 completes successfully. 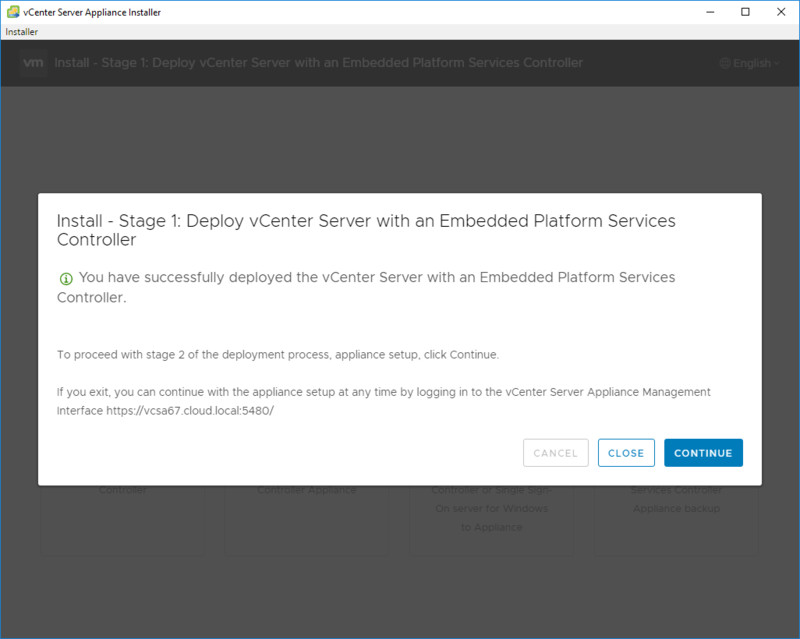 A link to the new vCenter appliance web client is displayed on the Complete screen. 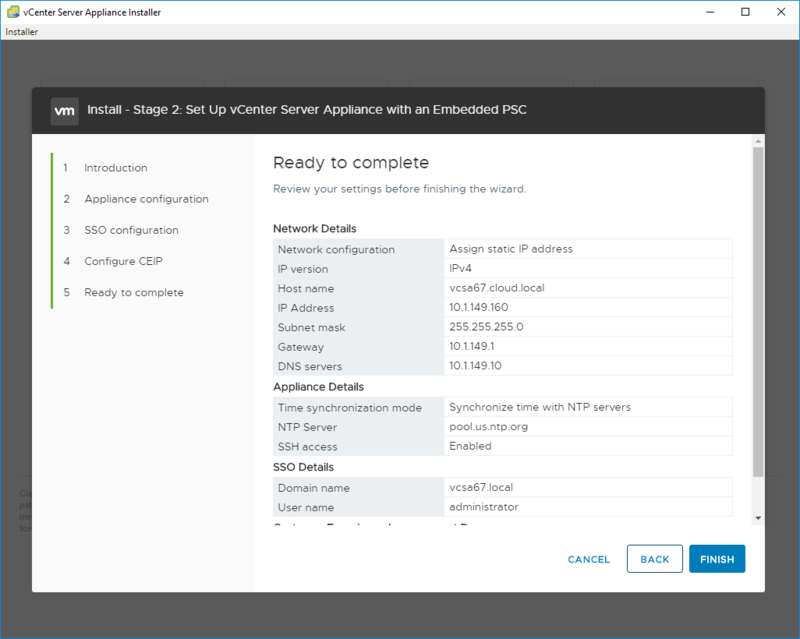 VMware vSphere VCSA 6.7 New Features Installation and Configuration contains some exciting new features that administrators will be able to take advantage of in their vSphere environments with vSphere 6.7. 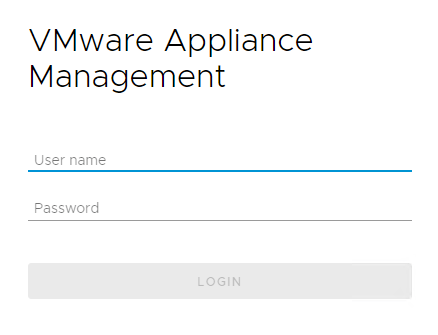 VMware has definitely covered some ground in getting the UI updated to the new HTML5 UI clarity theme both in the web client as well as the VAMI interface. 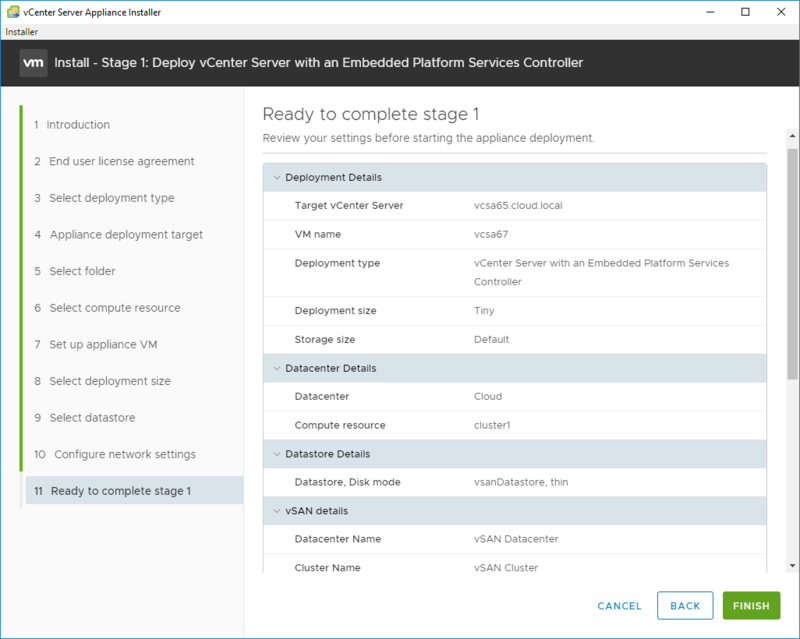 The new options in the VAMI interface for monitoring and other upgrades to the backup utility including scheduling is making this a powerful interface for managing and monitoring vCenter Server 6.7. Stay tuned for more vSphere 6.7 coverage here as we continue to show upgrades, installs, etc.